After discovering they enjoyed the influence the had with many young adults in the country of Uganda, the Hunters legally established Next Generation Ministries in both the U.S. and Uganda. This work is governed by a Board of Directors which meets annually for evaluation, focus, and strategy. 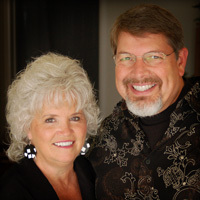 Next Generation Ministries was founded by Paul and Pam Hunter after 35 years of spiritual leadership in local church ministries. Having discovered that their greatest impact seemed to lie in the influence of the younger generation to build the Kingdom of God, their primary focus turned in that direction. For a number of years in the 90's the Hunters gathered dozens of teenagers in their kitchen (for obvious reasons) and their family room for discussions of spiritual things. Paul taught worldview, speech, character and leadership, and spiritual growth classes at a campus high school for 8 years. The Hunters also welcomed many young men and women into their home as residents over the past couple of decades. Paul and Pam Hunter's ministry is dependent upon contributions of those who desire to share in their vision to encourage, equip, empower and release the next generation.